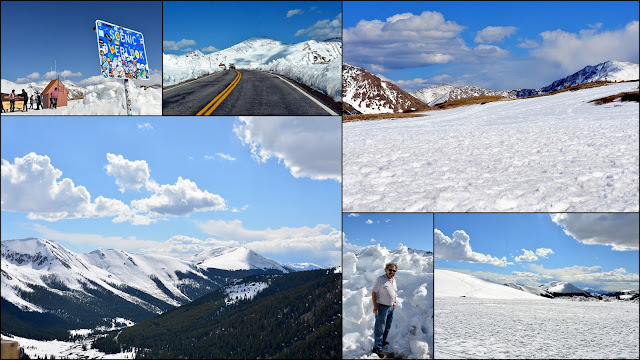 Last week I blogged about the beginning of a drive my husband and I went on Highway 82 to cross over Independence Pass, which is the highest mountain pass in Colorado. It is only open from the end of May through sometime in October as the rest of the year it is covered with heavy snow. Click here to read that post. That post ended with our stop at the Independence town site--now a "ghost town" of abandoned and crumbling buildings, remnants from a once thriving gold rush site. Independence Ghost Town is located 16 miles east of Aspen, Colorado, on Highway 82. There was a parking area off the highway, and then a hike down towards the town. You can see some standing buildings in the photos above as we approached the town. Legend has it that the town of Independence was formed when prospectors discovered the Independence Gold Lode on July 4, 1879. A tent city sprang up that summer and by the next year there were 300 people living in the camp. Placard on the site--click on to enlarge. By 1881 the Farwell Mining Company had acquired most of the mines in the area, as well as operated the Farwell Stamp Mill and a large sawmill for their mines. The population of Independence grew to 500, and was served by four grocery stores, four boarding houses and three saloons. By 1882, the town had over 40 businesses with three post offices and an estimated population of 1,500 people! Even though we were visiting at the end of the month of May, there was still areas of heavy snow all around the ghost town site. I could only imagine what the winters were like there, with many feet of snow for months on end from October to May, high winds, avalanches, hail, and cold. Those gold prospectors had to be a hardy bunch, desperate to strike it rich, in order to want to live here. Most of the buildings were complete ruins with the exception of a few, yet it was interesting to hike around the site and read the informational placards and imagine life in that era. 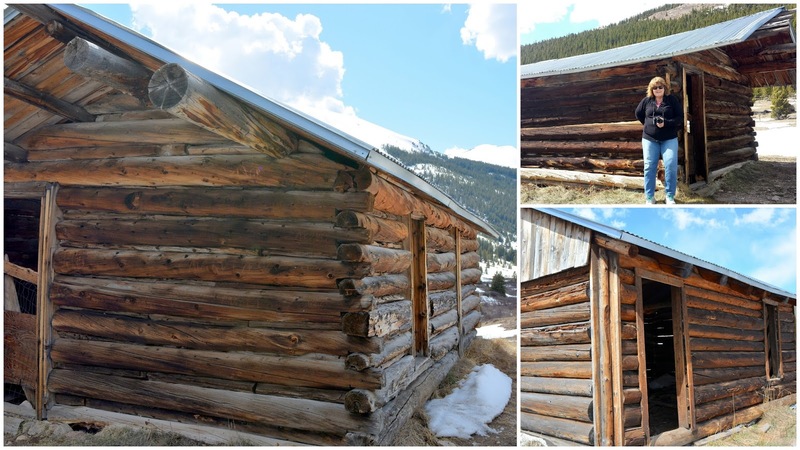 ....and this well built miner's cabin still stands. Life was harsh here at 10,900 feet and many miners were lured away from Independence to the milder climate of Aspen where they could also find abundant work, and good pay. Although mining at Independence proved to be short lived, over $190,000 worth of gold was produced between 1881 and 1882. The next year production fell to $2,000, and by 1888 only 100 people remained in the town. In the winter of 1899 the worst storm in Colorado's history cut off the supply routes to Independence. The miners were running out of food so they dismantled their homes to make skis and escaped to Aspen. It was the end of the town. To learn more about Independence, and to support its preservation, visit the Aspen Historical Society. After leaving the Independence Ghost Town we went back on our way on Highway 82 to travel over the pass. ...and we entered beautiful snowy landscapes as we traveled higher in elevation. The view looking down at the Roaring Fork Valley was magnificent! At last we were at the very top of the pass! There was a parking area and a scenic overlook. The snow at the side of the road was higher than our heads! ...and decided to walk to the overlook, as we saw others doing. 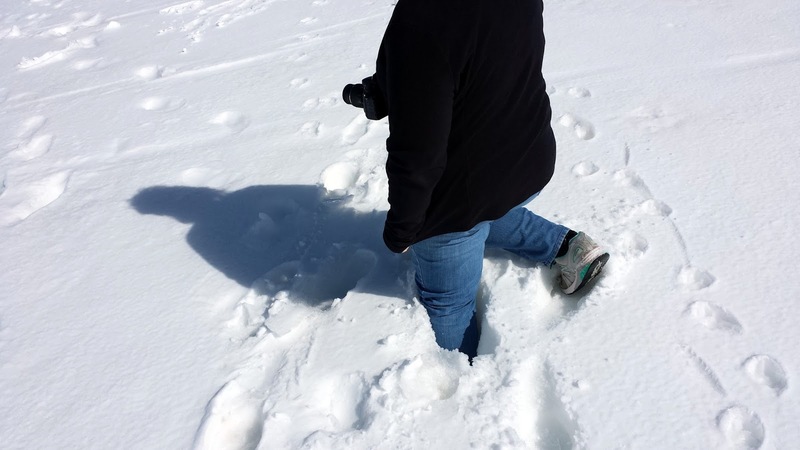 Unfortunately, we managed to walk into a snow drift and I began to sink into the snow. At first I thought it was funny until both legs were stuck in snow up above my knees and I could not move! My husband tried to help me out and then he also sank down into the snow. Two young men thankfully came over and helped us climb out. We were soaked up to our hips, and decided that was the end of our walk. 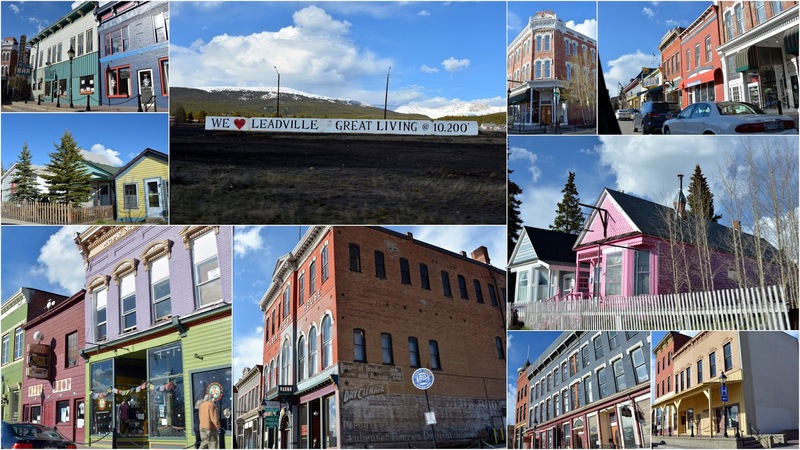 We then drove onto US 24, and into the town of Leadville, at 10,152 feet, it is the highest incorporated town in the United States. In the late 19th century this silver mining town was the second highest in population in Colorado after the city of Denver. ..as we'd also like to ride the scenic Leadville, Colorado and Southern Railroad train! From Leadville we drove back on I 70 east, and returned home. It was a very full and exciting day. 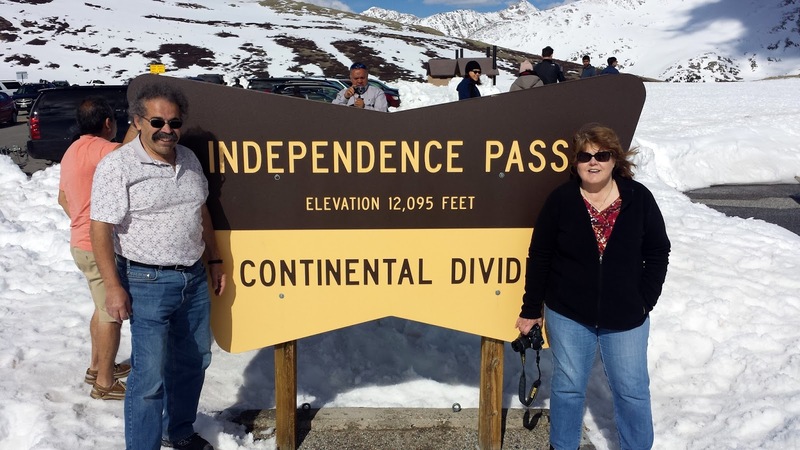 Colorado has many exciting and interesting places to see, and Independence Pass was definitely worth the trip! Click here to read part one of our ride over Independence Pass. I'm so sorry for my two week absence from blogging. My new computer took longer to arrive than I anticipated and then I had a problem with being unable to download the Google Picasa editing program, which I have been using for ten years, as Google no longer offers a download of the program. I tried their new Google Photos format and did not like it at all for editing. In my opinion it is much less user friendly than Picasa. After much searching of Google forums I did find a Picasa download I could trust, offered through a third party, so I'm happy to say I'm back in business! Whenever my husband and I drive west on I-70 we reach a portion of the road where this view of the Rocky Mountains--seen in the photo above--is ahead. It always reminds me of the John Muir quote: "The mountains are calling, and I must go." At the end of May we heard that Independence Pass had opened for the season, and we decided on the spur of the moment to take a drive there, as we've heard from many people what a beautiful drive over the continental divide it was! Come along for the ride, as I'll take you with me through my photos....and remember, all photos and collages will enlarge when clicked on. 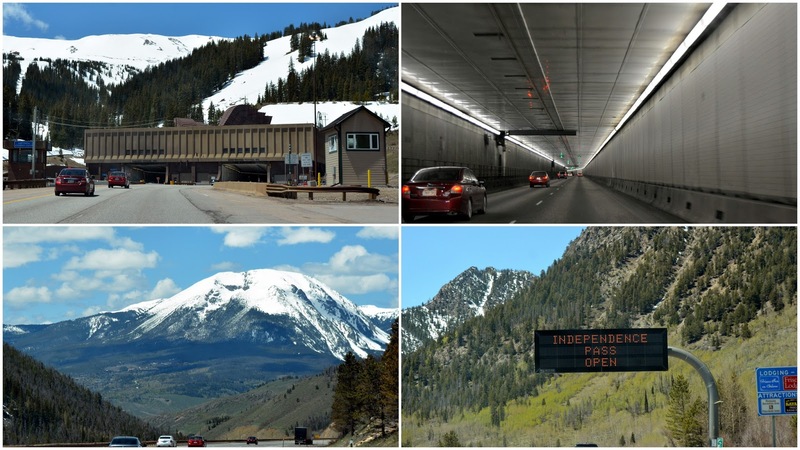 We soon passed through the Eisenhower Memorial Tunnel, The highest vehicular tunnel in the world, at 11,013 feet elevation. We were supposed to enter Independence Pass going west near the town of Leadville, but we made a wrong turn which lead us away in the wrong direction, so instead we decided we would continue west to Glenwood Springs, and then turn back towards Aspen and drive back through Independence Pass going east. 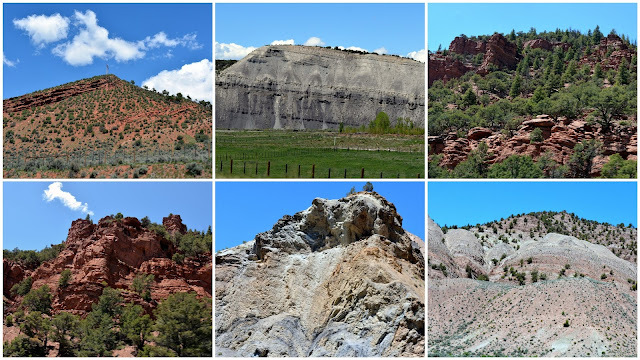 We passed some beautiful and interesting topography along the way. Living in this state makes me wish I had a degree in geology so that I would understand all the different rock formations that I see. We entered the Glenwood Canyon Area--excuse the glare on the car windshield in this photo. Driving through the canyon made me feel like I entered the world of J.R.R. Tolkien. 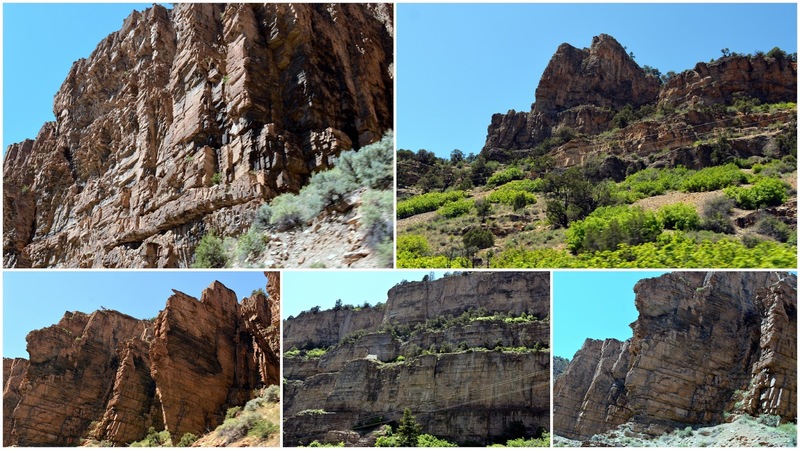 High and deep craggy canyon walls surrounded us at times and mesa steps covered with moss and shrubs. I almost expected to view a Hobbit, or two, waving at me from one of the ledges! We drove through the town without stopping, and turned east, but we have a trip planned to visit Glenwood Springs later in the year. Soon we had a beautiful first view of Mt Sopris. 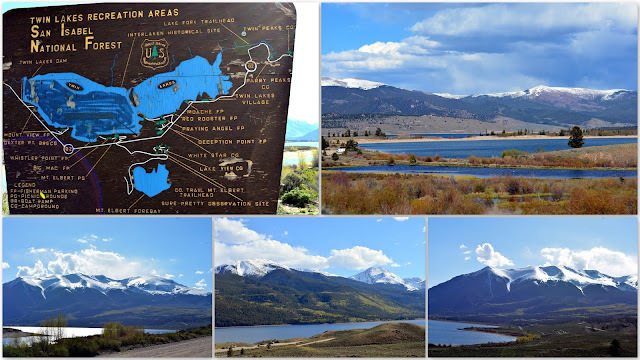 Mt Sopris is a twin-summit mountain in the northwestern Elk Mountain range of the Rocky Mountains. The 12,965 foot (3,952 m) mountain is located in the Maroon Bells-Snowmass Wilderness of White National Forest. Soon we entered Aspen. 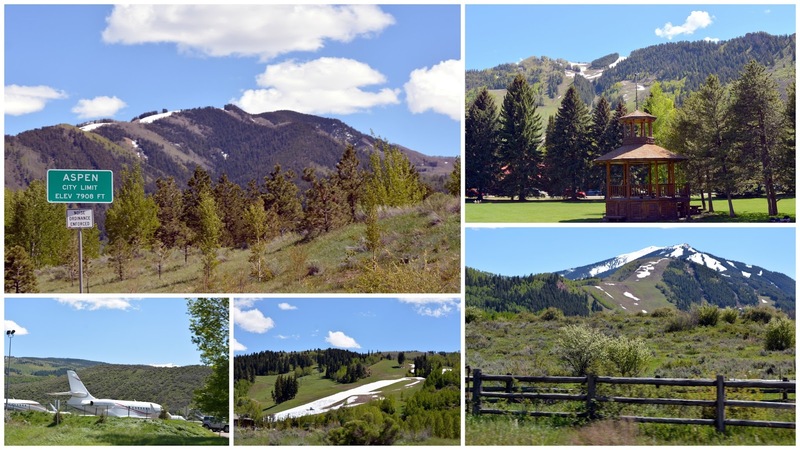 At slightly less than 8,000 feet elevation the snow had almost disappeared from this world renown ski area. This view near the town reminded me of a scene from Europe. 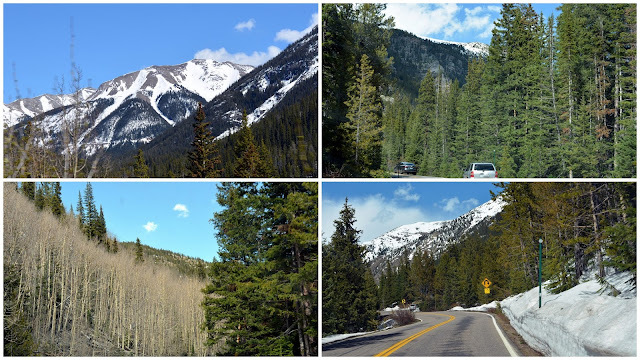 We passed many magnificent aspen groves along the way, which made it apparent how the town of Aspen had gotten its name. ...and even more aspen trees that were in spring bloom. Cars stop to allow opposite traveling cars pass by. All the while the views surrounding us are endless! Highway 82 is twisty curvy but does not feel dangerous. There are pull offs where one can camp, picnic, find restrooms and take hikes. The Grottos Trail is popular and passes a waterfall. As we continued to drive to higher elevations we began to see snow on the ground, even though this was late May. Because of heavy snowfall in this area Highway 82 is usually closed sometime in October through mid to the end of May. We saw another 14,000 foot mountain, La Plata Peak ahead. When we passed the ruins of an old mill alongside the highway we knew we were approaching the ghost town of Independence. We pulled off to a parking area to explore this once thriving mining town of 1,500 people and over forty businesses. 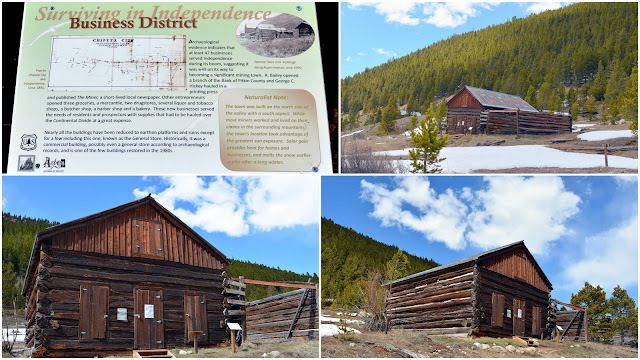 I'll show you what we saw in my next blog post, Part Two of our journey over Independence Pass!Click here to read that post which includes the Independence Ghost Town.